Back to nail polish strips. Let me just say: I really, truly love Sally Hansen products. Now that that is out of the way. This product was trash. Hot burning, flaming, smoking trash. 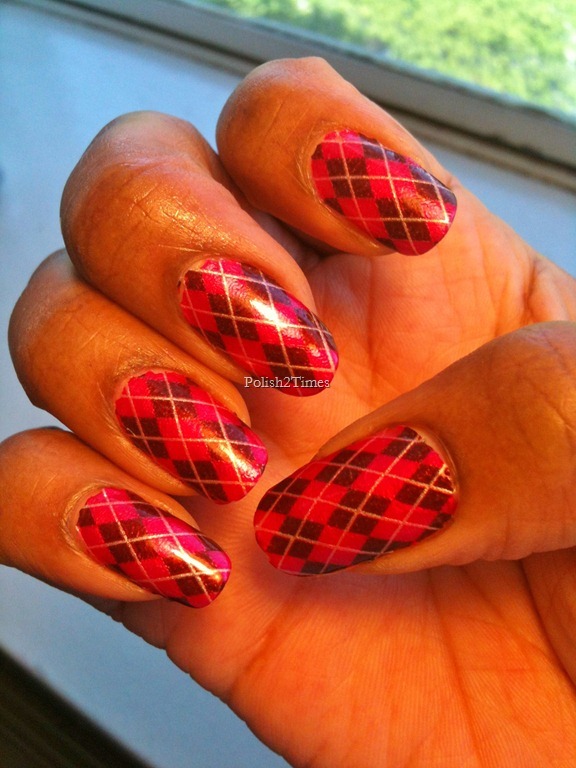 I wanted so badly to have this argyle pattern on my nails. But it took FOREVER to apply this particular design. And maybe it was user error all day. Perhaps my nails are in the way now that they have grown out and made it more difficult to apply the polish strips. But I don’t think so. 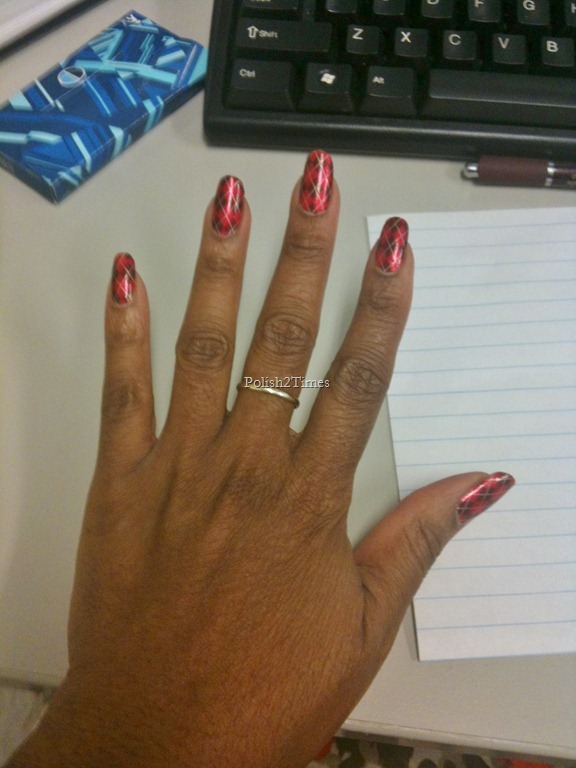 The last time I used Sally Hansen strips my nails were even longer. (Houndstooth design). The diagonal white line in this design was printed in such a way that the strips kept tearing easily at the point where the line was printed. . ALL BAD! It took like 40 minutes to apply these suckers. I COULD HAVE JUST POLISHED A DESIGN BY HAND ON MY NAILS IN THAT AMOUNT OF TIME! Applying a polish strip is supposed to cut DOWN on manicure time and potential error. This application turned out sloppy. And I was disappointed in the flaws. But I did still love the design… wore them for three days – flaws and all. I used them on my toenails too . That was fun. From afar, they still looked great! And maybe that’s all that really mattered anyway. 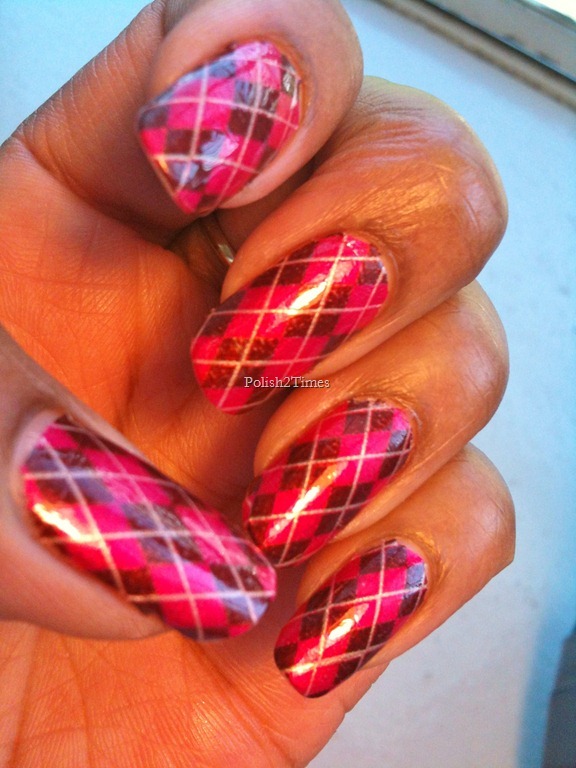 This entry was posted in Nail Art, nail polish, Sally Hansen, Sally Hansen Salon Effects and tagged argyle, nail polish strips, sweet tart-an. That’s a shame. Because they look fabulous! 🙂 Thanks Amanda!!! lol. I still liked them. I almost didn’t take them off either. Like I said. FLAWS AND ALL! I was so frustrated with them though. I love argyle. It’s too bad they gave you such a hard time. They look really cute!!! But sound like a pain. My frustration tolerance is too low for those! lol. mine too, but i always end up with amnesia on the struggle…. the designs are so cute. They look really cool…to bad it was so much trouble to apply. Now I’m scared to try the strips! The toes were cute! don’t be afraid to try the strips. they are nice. 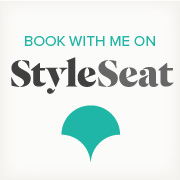 they are great for a nice detailed design without so much effort. 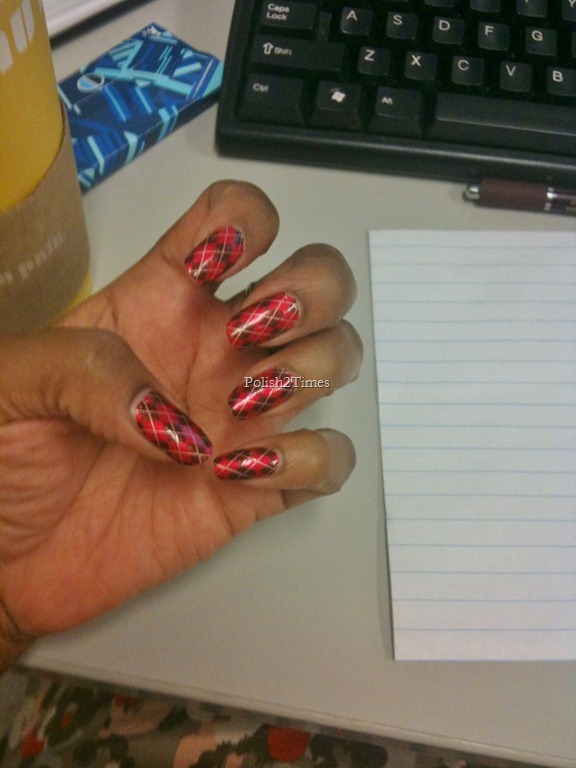 this particular design gave me difficulty, but overall the strips are great!